Does This Anime's Opening Look Unintentionally Sexual? Or maybe, it's intentional? Or maybe it's nothing at all? Who knows. But what is certain is that some think Future BuddyFight's opening credits get hot and heavy—but only for a few seconds. Blink and you'll miss it! 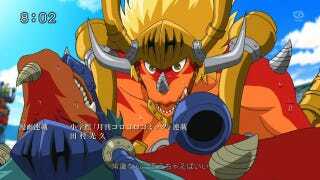 Based on a card game, Future BuddyFight also has a manga and an anime that began this month. In the anime, the cards act as portals to bring monsters to Earth to become "buddies" and battle thanks to "friendship and courage." The show and the card game appear to be aimed at kids. The scene, it seems, has inspired at least one viewer to create some fan art. This seems reminiscent of this infamous Pokemon GIF. In Japanese manga and anime lingo, "BL" is short for "boys' love" and depicts relations between male characters. On 2ch, one commenter called this sequence "BL," adding "Beast Love" in parenthesis. Others were amused at how suggestive (and sweaty) the monsters were. They're just buddy fighting! Get your minds out of the gutter.